If you haven’t had a chance to visit the “Superheroes in Gotham” exhibit at the New York Historical Society yet, this weekend is your last chance. The exhibit, which is installed in a three-room space on the second floor, covers considerable ground, from the origins of Superman, Batman, Wonder Woman, and Captain America, to the relatively recent introduction of DMC comics. In addition to valuable first edition comic books and early posters featuring the superheroes, artifacts from Batman’s TV heyday, including the Penguin’s umbrella and Cat Woman’s costume, are on display. A sampling of work by Will Eisner, the “father of the graphic novel” is included, as well as photos of the first-ever Comic Con held in New York–see if you can spot the four young woman in the photograph. Some of the most famous comic book creators and artists , including Mr. Eisner, have (or had) ties to the Upper West Side. Stan Lee, who, at 93 continues to make public appearances, is said to have been born in his parent’s home on West End Avenue and 98th Street. Like a number of his peers in the field, who were unable to get work in advertising or publishing because of their Jewish background, Mr. Lee (born Lieber) left an indelible mark on popular culture. With most of the artifacts in “Superheroes in Gotham” on loan from other collections, visitors are prohibited from taking photographs in the galleries. 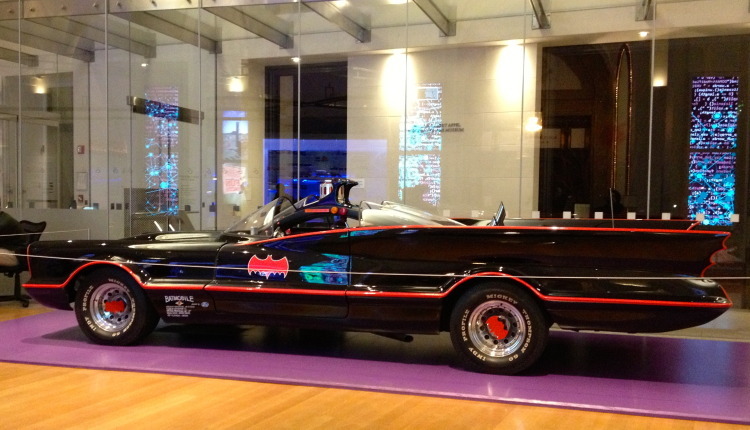 However, one of the original Batmobiles used in the l960s television series is “parked” on the main floor of the museum, where you can snap away to your heart’s content. “Superheroes in Gotham” closes at end-of-day on Sunday. The museum is open late and offers a “pay what you wish” admission on Fridays from 6 until 8 pm.